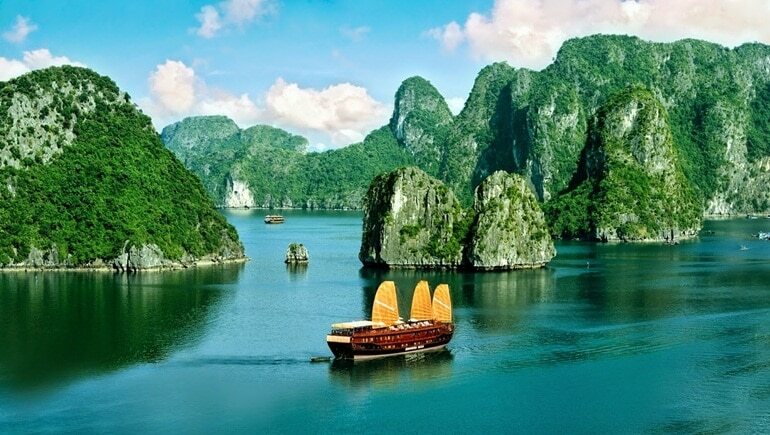 Home » Vietnam Travel » Attractions in Vietnam » Tra Co Beach – An Irresistibly Beautiful Beach In Quang Ninh, Vietnam! 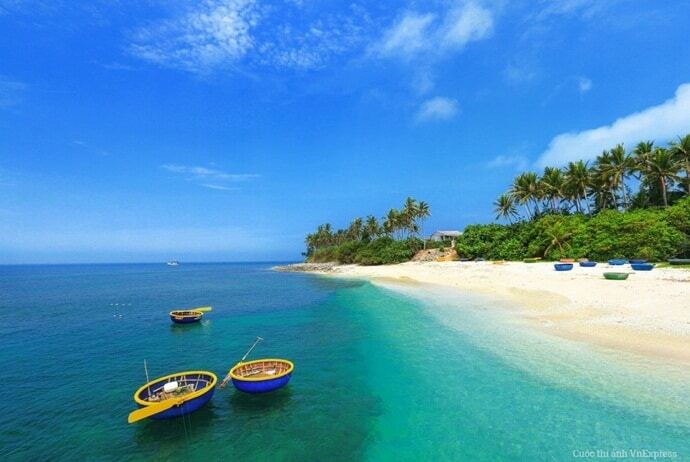 Tra Co (Trà Cổ) Beach is about 15 km long and located on the edge of Tra Co peninsula. 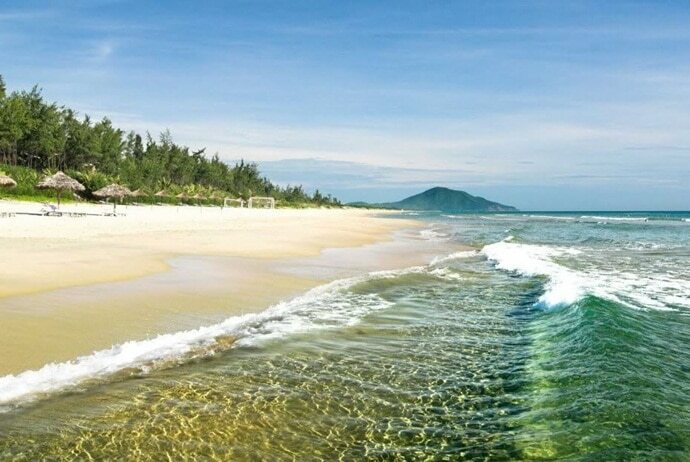 With the blue clean water and smooth white sand, Tra Co Beach is known as one of the most beautiful beaches in Vietnam. This beach is located in Quang Ninh (Quảng Ninh) Province and about 9km away from Mong Cai (Móng Cái) Town and 170km away from Ha Long (Hạ Long) City. With its advantages in location, Tra Co beach is the great destination for tourists, especially people who come from China. In this article, Vina.com will guide tourists step by step to have a great trip to Tra Co beach! 1. How To Get To Tra Co Beach? From Hanoi, going to Tra Co Beach by bus is a bit tired because of a long time of 7 hours. Nonetheless, going by bus can help you enjoy the Red river delta, natural beauties as well as mountainous area. Also, visitors can get to Tra Co from Hanoi to Mong Cai by car, and take a car to Tra Co beach. Besides, getting there by marine may be faster and easier. 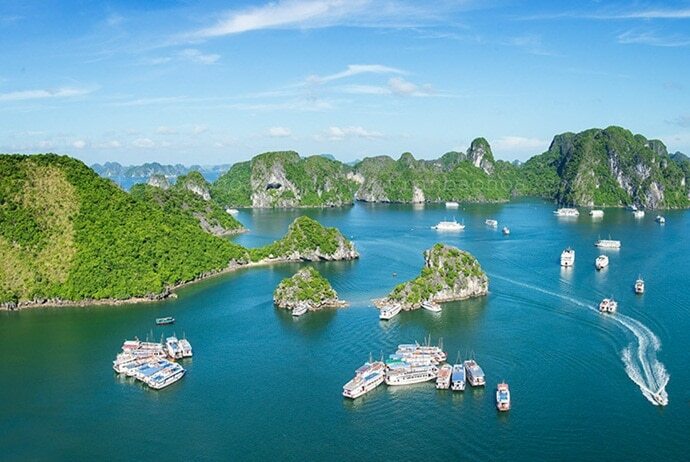 After visiting Cat Ba Island or Ha Long Bay, take an express boat and it takes about two hours to reach to the beach. By this way, you can also enjoy the feelings of floating on the sea. When it comes to traveling Tra Co Beach in Quang Ninh, tourists should know more about the weather of this area. In summer, it is hot and has lots of rain and in winter, it is cold and does not have a lot of rain. From May to September, it is the rainy and hot season, and from November to March, it is the dry season. In Tra Co Island, there are four seasons- spring, summer, fall and winter in a year. In July and August, it has many typhoon and storms. As a result, tourists should not travel to this island on these months. Due to a far distance from the industrial zones and city, the atmosphere here is cool and fresh. The average temperature is 22.7oC. There are 4 months from December to March when the temperature is below 20oC, and the highest temperature is 28oC only in the summer. 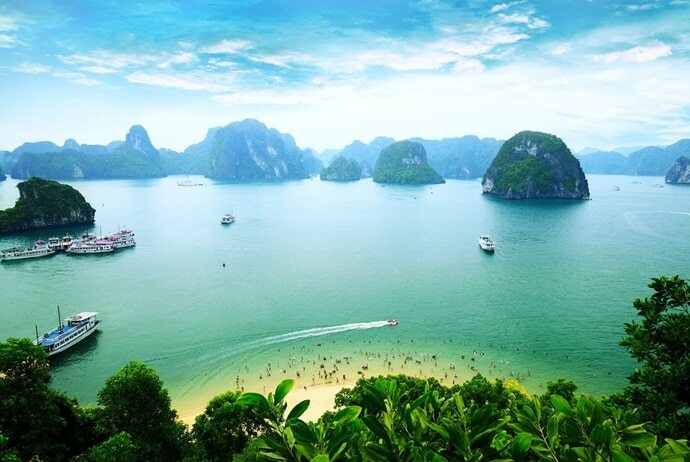 Tra Co beach is known as one of the most beautiful and romantic beaches in North Vietnam. Now, it has become a favorite destination for tourists. Tra Co Beach is about 10km away from the center of Mong Cai Town. It may take about 15 minutes to get to the border area by bus. This Beach is over 17 kilometers long, starting from Mui Got (Mũi Gót) to Mui Ngoc (Mũi Ngọc) . Due to the huge size, this beach can accommodate a large number of visitors at a time. The water is very clean, so tourists can see the rows of greenish tress and mountains reflected on the water. This is really an interesting experience for tourists. Unlike other beaches, Tra Co Beach in Vietnam still retains its primitive beauty. Swimming is a usual activity here. The water of Tra Co beach is warm and clear. Swimming glasses, swimwear as well as other gears can be rented at stores in front of the beach. Apart from swimming, tourists can watch sunset on the beach with many colors fading to the horizon. Now, keep reading this article to know more about Tra Co Island as well as what tourists can do in this island. The name Tra Co is the combination of two villages, namely Tra Phuong (Trà Phương) and Co Trai (Cổ Trai) in Do Son (Đô Sơn), where people came to settle about 600 years ago. This island was 100m from the mainland. In 1952, a small rock path was built by the French to connect the two sides. And, in 1954, the authorities turned it into a road to connect the island and the mainland. On the way to Tra Co beach, tourists can see crowded villagers who live mostly on fishing activities, many high sand dunes of 3-4m, rows of Casuarinaceae that help protect local residents from sand storm. The fishing village is also located here, so tourists can witness the life of the fishermen. The locals get used to the problems on the border, so they are resilient and sturdy, yet welcoming for tourists. After a few hours of catching seafood with the local fishermen, tourists can enjoy a meal of fresh seafood right at the fishing boat. Tra Co communal house is the pride of Tra Co people. It was built in 1462. Although it has been repaired many times, it still retains the original sculptural art and architectural style. It has 7 large rooms with carvings of clams, dragons and snails. All of six people who are worshipped in the Communal house came from Hai Phong (Hải Phòng). All of them were the first people who stepped in the zone and built the village 400 years ago. Besides, the House also worships Nguyen Huu Cau (Nguyễn Hữu Cầu) who was the leader of a revolutionary under Le-Trinh dynasty. Apart from Tra Co Communal House, other historical and cultural monuments on the island are Linh Khanh (Linh Khánh) pagoda, Xuan Lan (Xuân Lan) pagoda and Tra Co Catholic Church. Van Lien pagoda is a famous pagoda in Mong Cai town. It has many ritual objects that hold cultural and spiritual value. The pagoda is very crowded with visitors on annual festival which occurs between 30th May and 6th June( lunar calendar). Visitors can see many rituals and competitions. 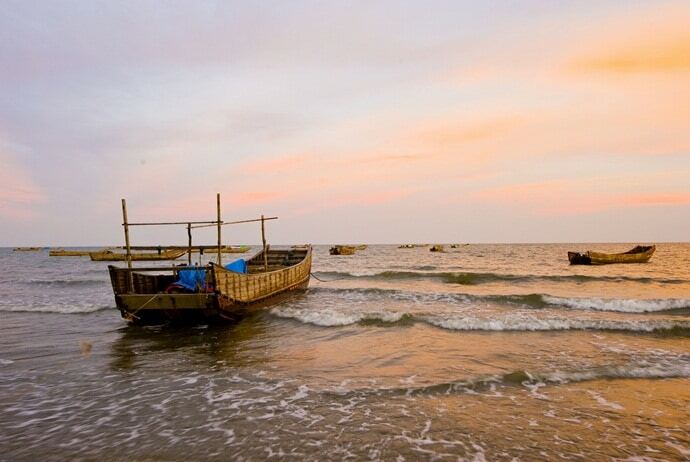 Just 6 km from the beach, at the Con Mang (Cồn Mang) sand-bank, tourists can relax by witnessing the sunrise and sunset. The sand is smooth and solid, so tourists can try riding a motorbike on it. Closed to Con Mang that is Vietnam’s border with China, tourists can see China clearly from this border point. Although the Border War occurred many years ago, tourists can find a few underground shelters along the two sides. Tourists can go shopping in the Mong Cai border where has lots of Chinese goods. Also, tourists can visit Mong Cai night market where has lots of household items and souvenirs. Visitors can also pass the border checkpoint for a vibrant shopping. Just remember to bring your ID photos and ID card. Tourists can also enjoy Chinese dishes when getting into Hong Van Center. If tourists visit Tra Co Beach at the end of May (lunar calendar), they can join in Tra Co festival that is held from May 30 to June 6. During 6 days of Tra Co festival, all of the quintessence of Tra Co Beach will be revealed to tourists. Some main activities are boat paddling starting from Tra Co to Do Son, boat racing, cooking competition, fat big competition, etc. On the last day of Tra Co festival, an ancient dance is performed to pray for an abundant fishing season and a happy, prosperous life. This festival is very crowded and it is characterized by the spirit of the local people. Most tourists love Tra Co Beach in Quang Ninh as there are very few restaurants, shops and street vendors here. If you want to eat some fresh seafood, you can buy fresh seafood from fishing boats. Some local specialties here are made from crab, cuttlefish, squid, shrimp and oysters. The most famous dishes are made from king crabs and Sam. Tourists can enjoy dishes such as sam fried with chili pepper, sam salad, fried sam egg, sweet and sour stir-fried sam, etc. Also, if you have a chance to explore Mong Cai city, you can enjoy dishes such as Tien Yen chicken, “gat gu” cake, etc. All of these dishes are extremely attractive and strange. Generally, Tra Co beach in Vietnam has many natural features. So, if you have a chance to go to Quang Ninh City, you should not miss this beautiful beach. 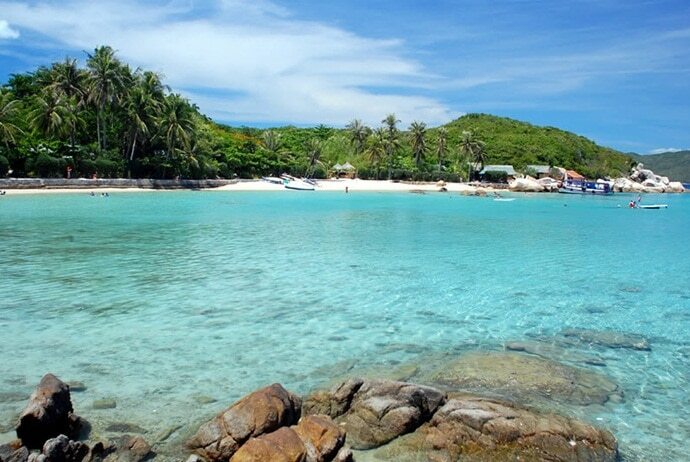 Please come to Tra Co Island in order to explore this charming beach.